P3 has been working hard on their maths, they have been practicing subtracting numbers using different strategies. 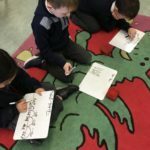 A group of children worked in threes, subtracting 3-digit numbers, each had the same sums but used different strategy – column sums, partitioning numbers or using empty number line. Then they re-grouped into same strategy groups and compared their workings, helping and explaining to each other how they used a particular method, effectively becoming their own teachers.